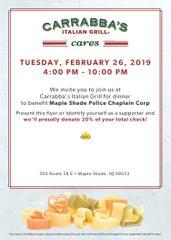 Maple Shade Police Chaplain Corp Dine and Donate Fundraiser at Carrabba's Tue. 2/26/19 4-10. Save the Date! we’ll proudly donate 20% of your total check!